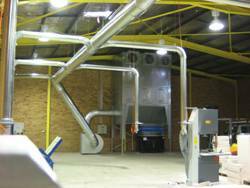 Australian Dust Control was recently commissioned by Aerostone to design, manufacture and install a Reverse Flow dust filtration system. Aerostone have a new factory at Guilford, in Sydney where they cut & mould aerated concrete for architectural features. The Reverse Flow dust filtration system installed at their new site had an 18.5 kw extraction fan incorporated into the design to extract the super fine concrete dust produced as a waste product. To contain these very fine dust particles a 3 cubic metre storage bin with a plastic liner was used for Occupational Health and Safety purposes to eliminate any air-born dust within the factory. As part of Australian Dust Control’s design for this Reverse Flow dust filtration system a greater filter surface area was needed to extract the very fine dust. For this application 3 additional cleaning fans were added.